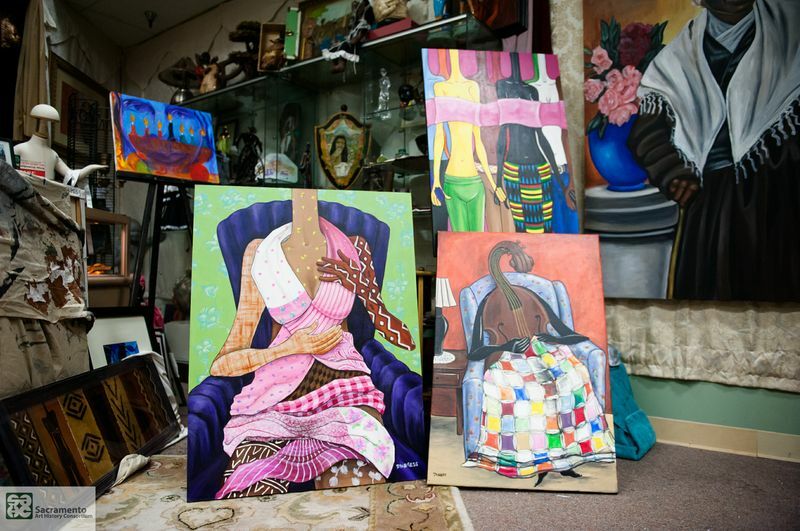 DB: I am an African American artist living and working in Sacramento. My background is layered with the love of art, hands on experience, and the desire to increase access to art in my community through teaching. I am a graduate of UC Davis, with a degree in Art Studio. My career as a professional artist began as a scenic artist for numerous theatre and production companies. I began teaching art about 15 years ago and continue to teach for various school programs, senior facilities and community centers throughout Sacramento. I work with many local arts organizations as a program manager, special projects coordinator, staff trainer, community liaison, and educator. I continue to paint, sculpt, design jewelry and work with other artists on community projects. DB: I work in many different mediums. I paint mostly, but I also love to draw…figure drawing is one of my favorites…I make jewelry, and ceramic sculpture. I recently developed a love for fused glass and textile arts and will be working in those mediums more in the future. I create by drawing from personal experiences and trying to convey my feelings, whatever they happen to be at the time, through my work. I usually start out with an idea and try to work out in my head how to make the artwork look as close to that image as I can. Sometimes I might say that “I just needed to paint it to get it out of my head,” maybe it makes it to the point of showing someone, maybe it becomes so personal that it stays in my private collection. Creating a piece can turn into a therapy session, I have something going on and I just need to paint it out. Or it could be that I just have an idea and painting it is the way I am more comfortable conveying it. Sometimes it is hard to turn off that art switch and in the middle of the night I wake up to paint something. And then by morning the idea would have changed numerous times. Whatever process I am working through at the time, I just try to keep it true to what I feel is “me” on canvas. I would say that I prefer working with abstracted or exaggerated forms. My education in art was more traditional but, over time, it left me feeling uninspired. I prefer a more whimsical style while dealing with social and personal topics. 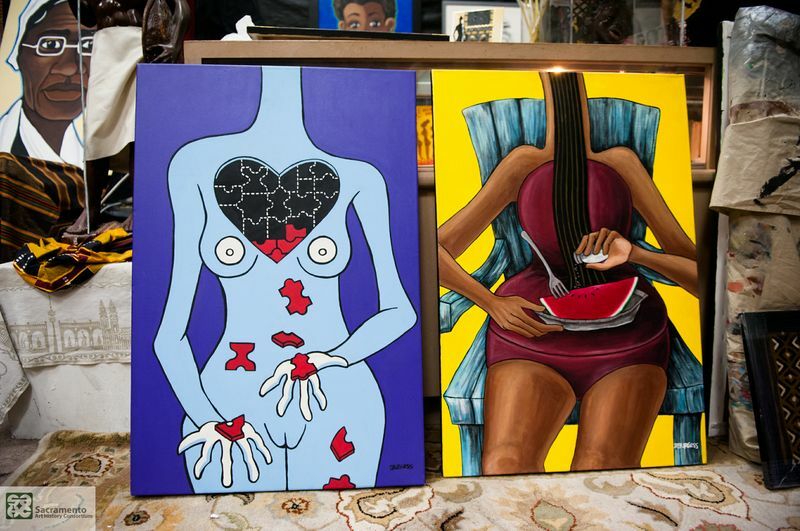 Bright colors and stylized forms characterize my current work about ethnicity, music, love, sexuality, culture and family. When I first started painting my torso series, I felt empowered in a way that I had never felt before as an artist, in part due to the subject matter and in part to the fact that I felt this style was more “me”. I began dealing with my femininity, sexuality, relationships and somewhere along the way I discovered that my art was personal, not just something that I was painting for someone else, which was what most of my scenic art was. 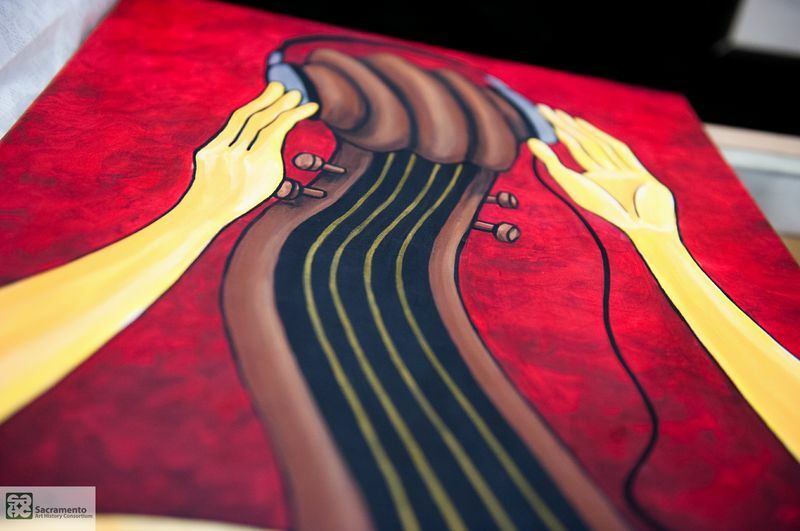 I also do a series of pieces personifying musical instruments, working with the idea that so much can be portrayed about a person without representational images of them. That particular style grew from some “portraits” of my grandmother as a quilted figure. I choose to pick up on the personality of someone through portraying the instruments in human situations. DB: The art scene needs a strong support system made of people who do their part to promote it and educate people about it. So often I hear discussions about the value of art and whether people truly recognize its worth. I believe that nurturing the idea of its value starts with the youth that I teach. If they see, from an early age, the way art makes them feel-the way that they can express themselves, the challenge that they face in creating something new, and how art directly reflects them as a person-they see how much value it truly does have. And as adults they will continue to appreciate it. As an African American artist, I personally feel a responsibility to teach about contributions of African Americans artists to the art world. That stems from my own struggles as a youth of not finding anyone who looks like me making art, thinking that I couldn’t identify with the images I was seeing and questioning “why do it?” I don’t want any child to feel that way. On a larger scale, I feel a responsibility to help increase access to the arts through teaching in underserved communities. DB: I would say that you should experiment as much as possible. Art encompasses so many different things and you need to find out what aspect really inspires you. DB: There are so many local artists that I like for different reasons I couldn’t possibly name them all so I’m going to narrow my choice to just one. I would say that would be Shonna McDaniels. She is so talented but does so many things she doesn’t get much time to paint. And actually her artwork isn’t really the main reason why she is one of my favorite artists. 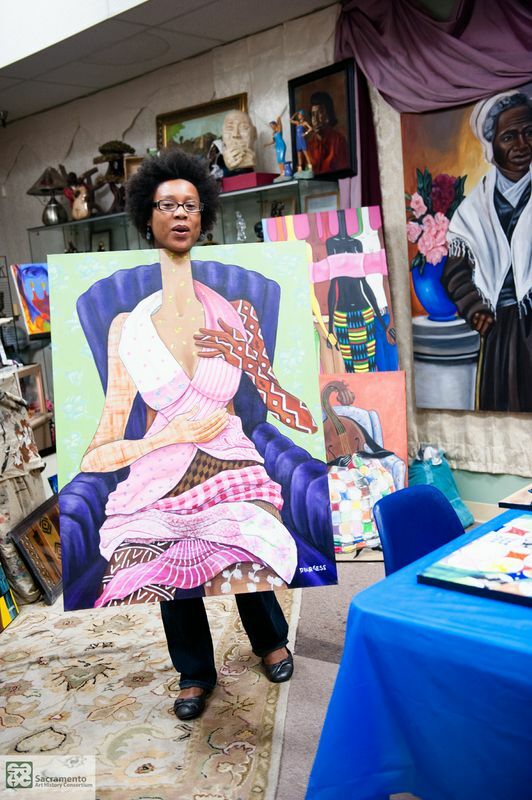 Shonna works tirelessly teaching art to youth all over Sacramento. 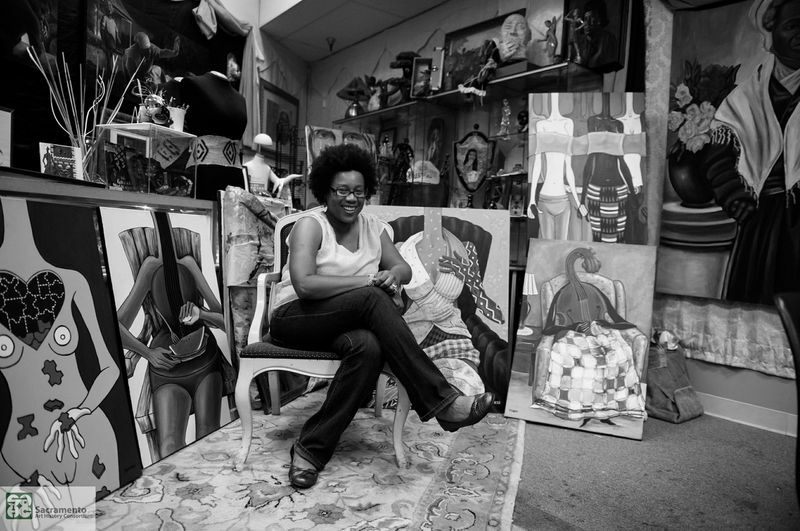 She has made it her personal mission to engage youth is art, more specifically African American art, and highlights artists across every medium that have made an impact on the African American art legacy. DB: I love books! I am very old school I guess, and maybe it’s partially due to my art history background, but to me nothing beats finding that hidden treasure of an art book. I go to the library quite a bit, and bookstores. I also love talking to other artists. They are a great source of knowledge and inspiration. DB: I think there should be more support for small art groups. As a member of various small art collectives, I think they are often overlooked by the greater Sacramento community and just don’t get the support needed to thrive. There is great work being done by so many of us in small art groups and it is a shame that it sometimes goes unnoticed, especially by those who could be doing so much to help them out. DB: I have website, www.dburgessart.com. And I show regularly at the Sojourner Truth Art Museum, 1001 Del Paso Works and my own studio, Brown Sugar, which will be opening again soon. I was asked to do illustrations in a children’s book…a great story written by Ayanna Fabio…that will hopefully be out soon.